At the heart of every American needs to lie the dilemma of violence. Like a “What is this violence?” or maybe “What are we violence?” question phrased without punctuation, without pause, without consideration. Without consideration. We are Americans, and we have been fit with violence. We are puking with violence, but we appear so inconspicuous when we look into the mirror. We won’t admit it to ourselves, because we don’t have to admit it. It’s the privilege of being an American. It’s hard to say whether “ambivalence” could even resemble the American understanding of violence, because we seem to think there is only an abstract concept called violence only mildly associated with comfortable lives. We are a nation of not. As I would say Jennifer MacKenzie’s My Not-My Soldier makes clear. We are not violent only to the extent that we hardly ever talk about the violence we maintain as an active United States foreign policy. The waste of violence. Which is everywhere in MacKenzie’s poems. The presence of violence. The effect of detachment only detachable, because it feels like violence really wants nothing to do with us. This is all so imprecise, really. I understand. Because describing the way MacKenzie’s poems make violence present and confrontational and deliberate and manned and maneuvered is so fruitful and multiple and always. Imagine you had an entire mound of garbage. It kept building in your backyard inexplicably. Because, you keep thinking, it’s not like I’m actually throwing that much stuff away. When I was stationed in Norfolk, VA, there was actually a city park that had originally been a pile of garbage. They had covered it with grass and named it Mt. Trashmore. The dilemma, really, is how versatile Americans are when it comes to anything we want to maintain a sense of obliviousness to. Garbage. Violence. What would our response be if we let it get so loud in our lives, and that loudness was actually uncomfortable? MacKenzie’s book makes you uncomfortable. It puts you in Syria, in a city breathing in violence. It is inescapably political, but in that way that Alice Notley’s The Descent of Alette was confrontational and unforgiving in its feminist stance, but still deeply invested in the lyric form. Jennifer MacKenzie’s My Not-My Soldier assumes the position of witness. And lover. And so, affected witness. Influenced continually by her seeing of this place. What is the lyric of seeing of this place? What is the lyric continually confronting and influenced by and unequal, really, to what is happening right now in Syria? How is violence a language, or what language would adequately relate what is happening to a body that witnesses violence? What are the most appropriate ways to break open the normal grammatical confines of language so that a reader feels a life that is being lived amongst brutal, unrelenting violence? The poem opens in a confessional mode. It feels normal. The speaker is placing herself within a very normal action of everyday life, along with a very usual observation about her appearance. But that sentence swings from personal confession to tilted observation about the lyric. It has dead fish for eyes? Does this register a kind of flat gleam, which would help to understand, then, how that gleam must be lacking consequence in the “unnameable country”? Perhaps it’s because of what the lion lets happen to it. It is unclear, as this “unnameable country” portion of the quotation is actually a series of phrases that don’t amount to a complete sentence, though it does provide an opaque political statement regarding the country. And so the poem has shifted from personal confession to statement of poetics to opaque political argument, accomplishing all this by simply moving, or swinging, to a new subject mid-sentence. spend years writing books about books? wooden soldier at last at least? The dead girl is real, but imprecisely real. She is awareness of real, allowance of real, though admittedly not knowing the precise terms of who she is doesn’t unsharpen the knowledge this girl, or a girl, has died. And what is the language that would best keep that knowledge? How would a speaker of English fix this knowledge in place? What would this speaker, as a teacher of English, instruct her students to use for keeping anything dear? What would be the language of an exposed scar? And what if the scar were exposed and continually rubbed with a nylon cloth so it still felt raw and bare, and how could a speaker overcome that state of roughened sensation? For me, this is the motivating force behind MacKenzie’s book. It is not just to point out violence, or to give us that unpleasant threatened anxiety that comes from being in the middle of violence. It is to point out that there are people who live in this kind of world every day. As Americans, we are unlikely to fathom it. 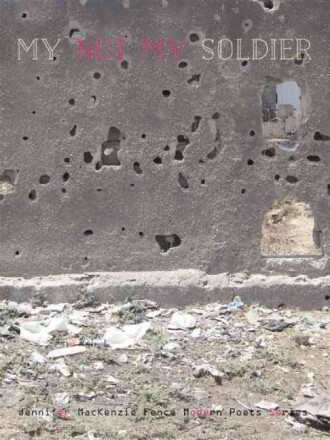 And if there is to be a poetry, an act of language, that will propose a fathoming experience for its reader, then MacKenzie’s My Not-My Soldier is a book ambitious to this cause.